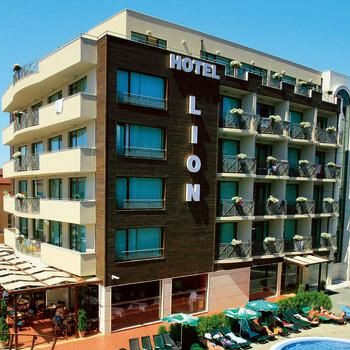 The Lion Hotel was really clean, the rooms were very comfortable & spacious, also the maids come in every day. We also had a bath which was unusual and also very hot water. But the beds were really comfortable The food was always cold even when you went in at 7:30 when they first opened, not a wide choice of food unless you were a vegetarian. Out of the 2 weeks whilst we were there I had to ask for a teaspoon to stir a cup of tea 12 days out of 14, the plates were also very wet. And the majority of staff were so miserable, apart from one waitress and a waiter, but he wasn't even Bulgarian. Pool area was very clean but was too cold to have a swim. We was coming home a day before they were closing down for the season,and two days before that they started to take the sunbeds away, also the flags from outside the hotel, it seemed like they were trying to get rid of you.The bar when we first arrived didn't have no Brandy & also Lemonade. The Bar area had only 3 tables for such a big hotel, so the evening when we had a storm and couldn't get out, everybody went back to their hotel rooms. This was our first girls holiday away and we loved every minute of it! We found the rooms very comfortable and clean except from the fold up bed that broke every time you sat on it and there was no kettle. The food was not the best but it filled a hole, but when ever you go away its not English food so what do you expect. The staff were friendly and very helpful, and if it was your birthday the barman gives you free drinks and a flower woop woop. There was not much nightlife in the holtel but you dont need it with all the clubs and bars around you. Highly recommend disco orange and watching boys to the max! also the 18-30 bar craw great way to meet other people, find the best bars and get drunk! We stayed there for a week on a half board basis, the hotel is nice and clean, the maid service was daily and very thorough. Our room looked out on to the one of the two pools. There is 2 separate hotels each with there own dining room, the food was not nice at all except for the little cakes, we would check the dining room to see what was on offer but ended up eating out every evening, one morning I thought I would have toast only to find the bread was mouldy. The hotel is about a 5 minutes walk to the beach and 15 minutes to the resort centre not really ideal for those with mobility problems. We found the staff to be friendly especially the barman at the pool bar. There was no entertainment at all even though there was a lot of people who used the pool bar in the evenings. We would stay here again, we were only disappointed with the food. The hotel Lion is in two parts one built this year and the other about 2005. In general the hotel was very clean with maid service every day. On arrival(late at night) we were given a welcome pack sandwitches fruit and water by the reception staff. Our cases were taken to the room and the porter switched on the air con. The room was quite nice with air con, tv, and mini fridge it also had a balcony overloking the pools all of these were free. The meals in the hotel were sometimes repeated and not always hot wait till you see the replacement food coming out but breakfast was quite good. The hotel staff did not appear to freindly but we put this down to their English not being very good. They did however try to help you if requested and did smile once thay got to know you. The only problem with the hotel was one night we had a thunder storm and the road flooded so we could not go out.Thehotel bar is very small andcould not cope with the people wanting to use it (run out of drinks). The hotel location was about five mins from beach and prom but about fifteen into the centre althoug it was near the main road for all the bus services. I whould return to the Lion as listening to others and tails of their hotels did not seem to have got a bad venue for what we paid. We were told the hotel was centrally located, it took 15 minutes to walk to the resort centre and if it rains, forget it. The road floods and you are stranded. Not even cars can pass. The hotel itself was ok, a bit dark and I wasn't impressed with the live wire electrical boxes on my balcony. We were unable to use the pool due to the building site next door. Rubbish frequentley dropped into the water. I could sit on my bed in my room and have work men wave at me. They also liked to shout and whistle as you walked by. I had to change in the bathroom as they constantly leered in. I was assured that the building work finished at 7pm but they worked until after midnight every day and started again at 6am. The dining room could not cope with half the number of guests in the hotel and the food was not exactly appetising. There was no entertainment, apart from the drilling into the night. Also, stay clear if you are old, have trouble walking or have a small child. The bridge over the pool is really steep. My son fell out his pushchair on the way over. The pushchair had to be picked up and carried over. We stopped on half board basis.The hotel was very clean.The food in our first week was often served cold and became repetitive. The location is about 10 minutes walk from the resort centre and 5 minutes from beach. hotel staff were not particularly friendly apart from Angel.There was no entertainment.